A California jury will begin deliberating on Tuesday how much money Samsung should pay to Apple for the infringement of several patents in multiple models of Samsung smartphones. Apple wants just under $380 million, but Samsung is arguing it shouldn’t pay more than $52 million. The eight person jury made up of six women and two men heard closing arguments from lawyers on Tuesday morning after four days of testimony that focused on the iPhone’s influence and explored what drove consumers to buy the phones they did. A lawyer for Apple, Bill Lee, asked jurors to put themselves in the shoes of Steve Jobs and other Apple employees who “went to work before the sun came up and went home after it set” when working on the iPhone. He told them how Jobs took a risk and “bet the company” on the iPhone. Samsung argued the patents in question cover just a few areas of design and do nothing on their own to influence the buying decisions of consumers, so the money it pays should be much lower. The question in front of the jury is relatively simple, but the math could be complicated. That Samsung infringed on Apple patents isn’t disputed. A jury in the same San Jose courtroom ruled on that last year and awarded Apple a little more than $1 billion in damages, but shortly after Judge Lucy Koh cut about $450 million from the award citing incorrect calculations. This second trial seeks to recalculate those damages. On Monday, Judge Koh explained to the jurors how they need to go about figuring that out. Apple’s math combines three figures to come up with $380 million. The first is $114 million in compensation for lost profit. The company is asserting that it would have sold 360,000 additional iPhones had the infringing Samsung products not been on the market. Samsung says large screens, longer battery life and the Android operating system were among the reasons customers chose its phones. Those people wouldn’t have bought Apple products had the infringing products not been on the market and thus it owes nothing on this issue. Apple is also demanding $231 million for Samsung’s infringement of Apple design patents. 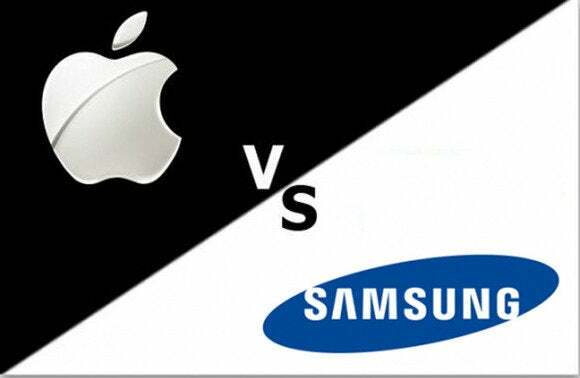 Rules allow Apple to claim all profit earned by Samsung on sales of products that infringe Apple’s design patents. “Is it a lot of money? Yes, but judge it against the revenues Samsung got,” argued Lee. With so much money at stake, it’s no surprise the two sides disagree on Samsung’s profits. Samsung asserts that Apple’s calculation fails to address multiple expenses that should have been taken out. Samsung says its real profits on the phones in question total $52 million. Convincing the jury of that is important, because Samsung has the burden of proof on this question. The remaining $35 million represents reasonable royalties that Samsung should have paid had it licensed the patents concerned, said Apple. On this, Samsung has suggested $28,452 is all it should pay. The jury needs to come up with detailed infringement figures for each patent and each phone. They have been supplied with two calculators to help their deliberations.